We have no-win weather in the Chicago suburbs this week. 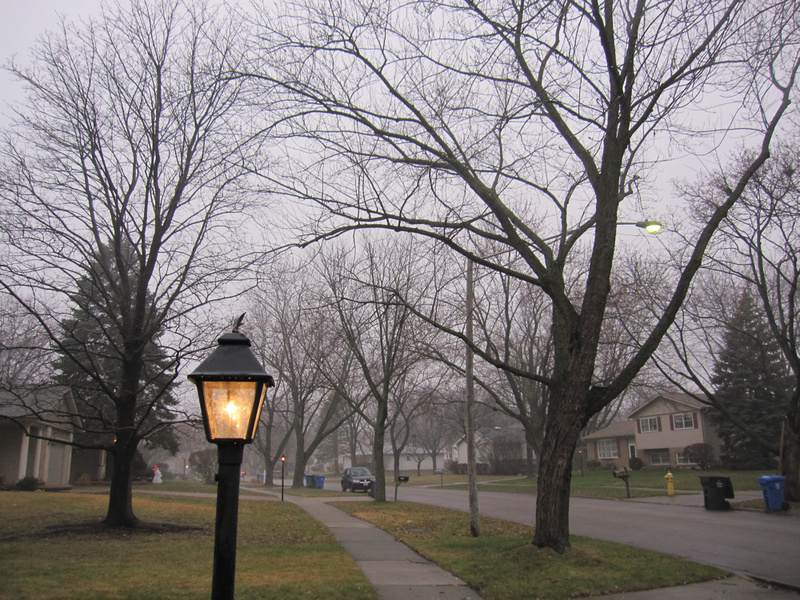 Earlier in the week it was warm, in the 50’s, but it was foggy, drizzly and gloomy. My lamppost, which has a light sensor, was on most of the time. Yesterday and today, the sun is peeping out from behind the clouds, but the temperature has dropped below freezing. We’re weather wimps right now. In February, when the temperature hovers near 32 degrees, we’re going to think we’re in a warming trend and wear our spring jackets. Right now, I’m bundling up in my down coat every day. I love my down coat! When the leaves started turning brown and dropping off of the trees, it made me remember how excited I was just a few short months ago to see the green leaves. How can the trees be bare again so soon? This kind of weather makes me think about summertime. On our family vacation, we went to the sunny state of Arizona. We spent time in the Painted Desert, where it was hot. I loved the flat plateaus, the colors, the blue skies and the endless highways. 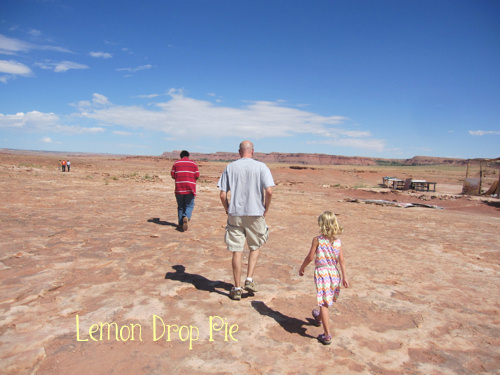 I loved feeling the sun on my face when we were looking at dinosaur tracks and standing on the Four Corners. One of our hotels in the middle of the desert had an outdoor salt water pool, and I wanted to stay by the pool all.day.long. Most of all, I loved being with Ed and the girls all.day.long. With the fall comes the cold weather and the bare trees. And also school and work and routine. Getting up at 6:00 to make breakfasts and pack lunches. Going to the grocery store, wondering what to make for dinner, picking up the girls from school and getting them to do their homework. The sun sets at 4:30, which makes it impossible to go outside and play after dinner. My California Dream is not about California at all. It’s about being outside with the kids and Ed; being away from our routine, being out in the sun. What’s your California Dream? Link it up here or at Second Blooming! Those are lovely photos. Actually we have been very cold here but of course 40 degrees is cold to us! Love all the pictures and the family you enjoy so very much! Thanks for sharing and stay as warm as can be! 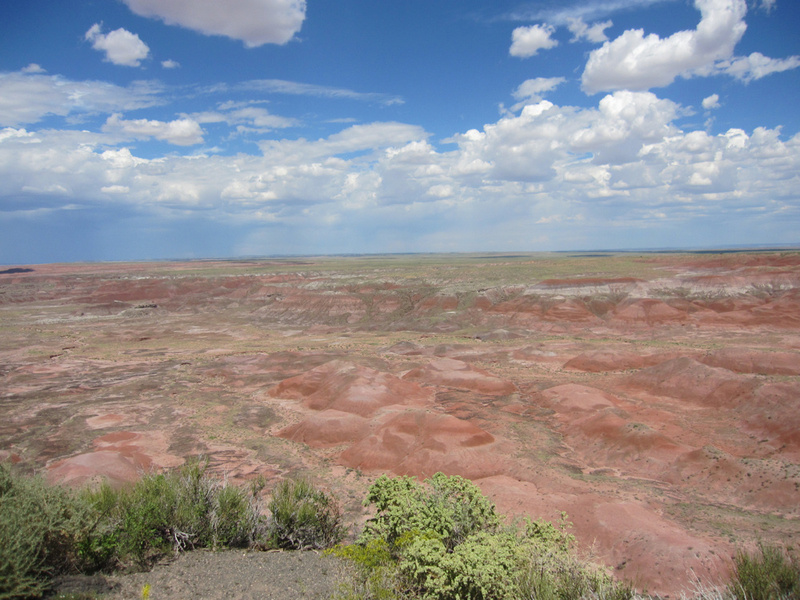 Your trip to the Painted Desert sounds wonderful. I think I’d rather deal with hot weather than with super cold weather. Really, it’s the sun I miss the most during the winter. To me, 40s and rainy is worse than 20s and sunny. Angelina Costenaro recently posted…Saint Nicholas: The Patron Saint of Single Ladies? That sounds awesome! I always wanted to see the desert. Fall is really pretty here and the only time that I really like snow is during Christmas but after that it can just go away. I would like summer to take over again. I loved the Painted Desert picture. Absolutely beautiful! You know, we’ve got some great deserts here in CA too. I say it’s time for a Palm Springs weekend. Hot tubs, golf, swimming. Go for it! I’ll meet you there! I’m all for winter going quickly! Here, here! Beautiful, beautiful photos. I have many California dreams and after this I’ll have to link one. I used to live there and something I miss a lot, not as much as the Pacific Coast Highway and the warmth, but I miss the energy bills! No heat and no a/c. We had one little space heater and that kept us warm all year. tamaralikecamera recently posted…Those Crazy, Stressful Holiday Times. Yes, please do link one up! My sister lives in San Luis Obispo, and she loves living out there! I really want to go visit; it’s been a long time since I went out to see her. That sounds amazing!! I love the sun too. I love hanging out by the pool with the kids in the summer. I do love the seasons, but I’d like for summer to be longer and the cold weather to be shorter. Not happening where I live though. I love the seasons, too, and am looking forward to some snow. But I do get sick of winter and last summer really flew by!